It’s been a good couple of months, and still, the poke bowl trend doesn’t seem to be losing steam here in Singapore. A healthy, Hawaiian-inspired version of our favourite chirashi don, that’s filled with raw fish and healthy to boot, it’s no wonder there seems to be a new poke place springing up every other week! Yet another poke stop has surfaced, specifically in the Bugis area of Singapore. This one is a little different from the rest, and we think those of you who love aburi-ed sashimi will especially like this. 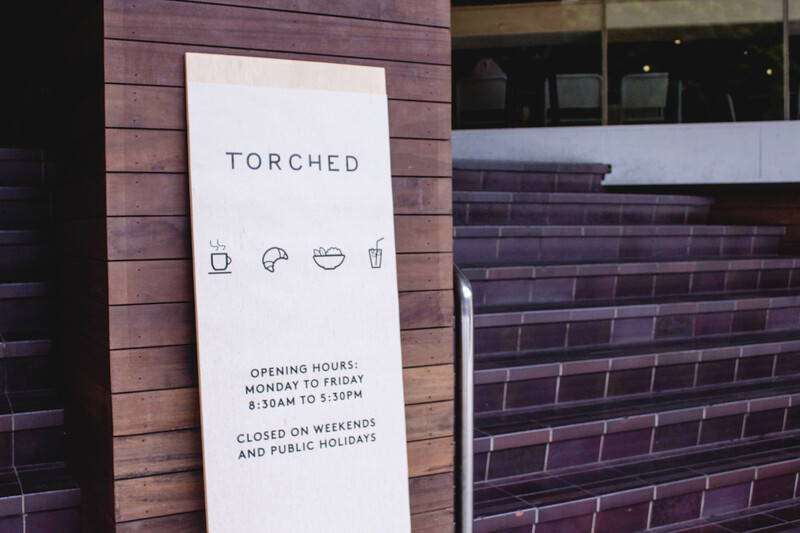 Located just a stone’s throw away from LASELLE College of the Arts, Torched shares a counter and dining space with specialty coffee concept One Man Coffee. The brainchild of 2 siblings – a brother-sister duo – the concept of torched poke bowls was a product of experimentation and spontaneity. After fooling around with a blowtorch in the kitchen, the pair stumbled upon a way to separate their poke bowls from the rest – serving up bowls with their ingredients torched! The result is a poke bowl that has all the usual suspects – raw fish, rice, seaweed – but with their flavours fired up. Like most poke places, you get to take your pick of either a signature bowl – where all the big decisions are made for you – or a customised bowl, where you can put all your favourite ingredients into one bowl! Torched offers 3 signature bowls: the Signature Torched Poke Bowl ($15), the Torched Tofu Bowl ($9), and the Roast Pork & Kimchi Bowl ($10). So many colours in one poke bowl! The Signature Torched Poke Bowl is a colourful mixture of torched salmon, tuna and tamago mentaiko on a bed of sushi rice and salad. The fish is fresh and lightly seasoned, so you won’t feel jelat halfway through your bowl. A fuss-free, flavourful bowl, this is an easy pick if you have trouble deciding what to put into your poke. Vegetarians, Torched hasn’t forgotten you. Their Torched Tofu Bowl is a vegetarian option that comprises torched sesame tofu and avocado on a bed of rice and salad. Cherry tomatoes, edamame, pomelo and seaweed are also added into the mix to give your poke bowl a tantalising variety of textures and flavours. 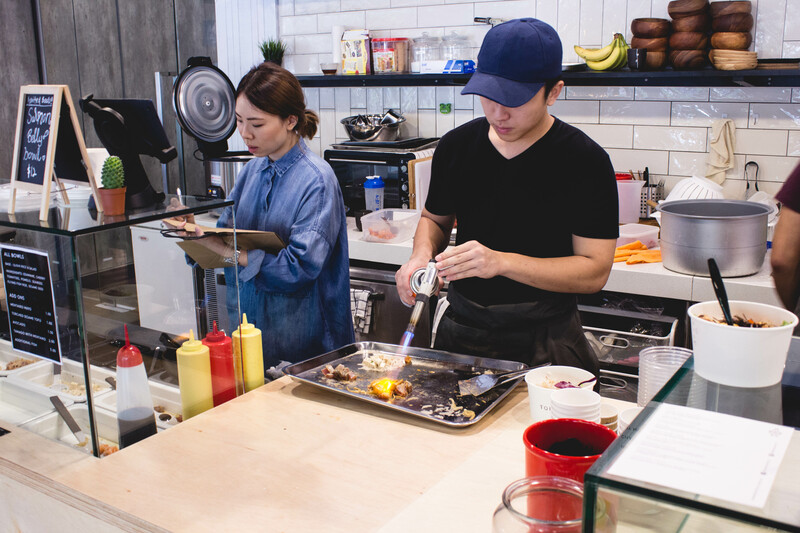 Poke bowls aside, their torched ingredients also come served in tacos and kueh pie tee “shots”. 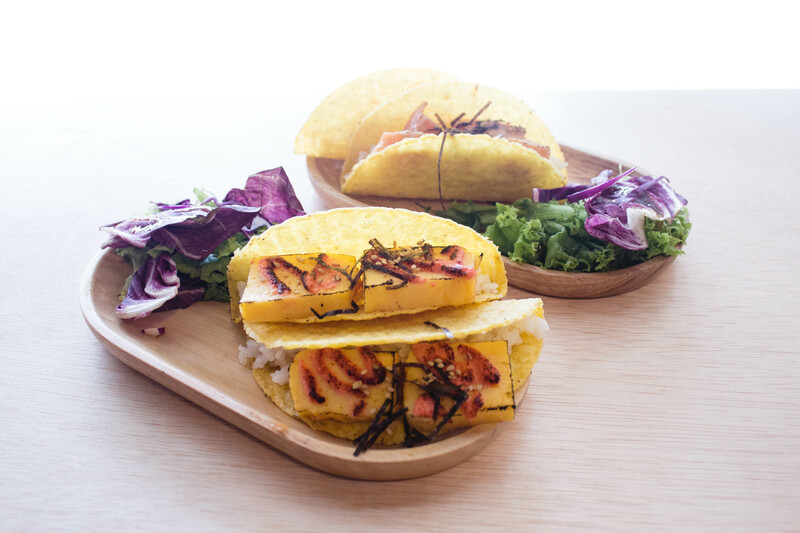 Fill your tacos and “shots” with tamago mentaiko ($6), spicy poke ($7), or roast pork & kimchi ($8). We recommend the spicy poke, which is spicier than we expected – not that we mind. 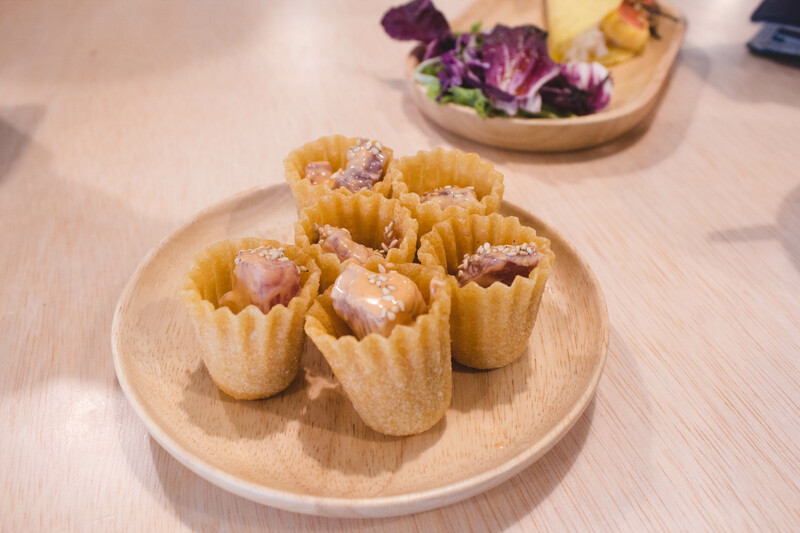 If you’re considering pairing these snacks with your poke, we suggest going for the kueh pie tee shots. Perfect for popping into your mouth, the kueh pie tee cups work interestingly with the fillings. That, and we love the crunch when you bite into these little cups. While we enjoyed the poke shots, we didn’t fancy the tacos nearly as much because the filling, rice, and taco made for a strange combo. With nothing tying the different elements together, the three tasted like completely separate entities that were just thrown together. 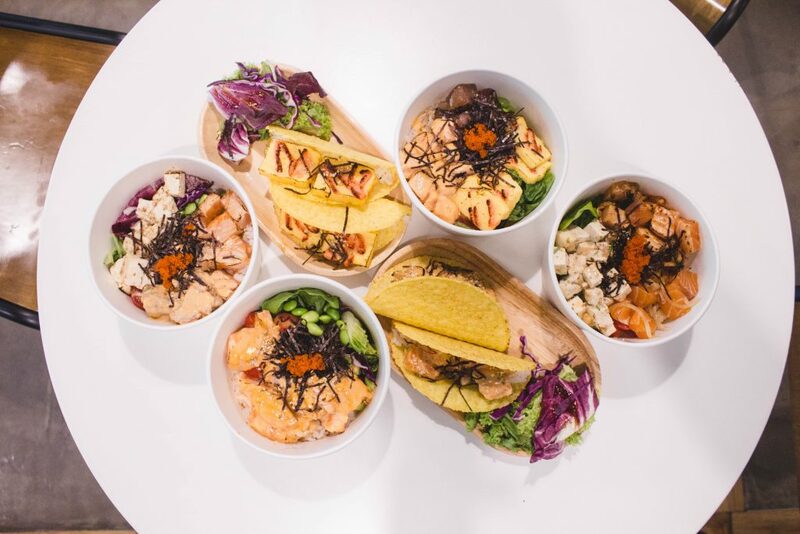 While poke bowl spots are becoming more common in our local food scene, Torched has taken a unique approach with its poke, and we think it’s pretty clever. After all, who doesn’t love the smokey-raw combo of aburi-style fish? 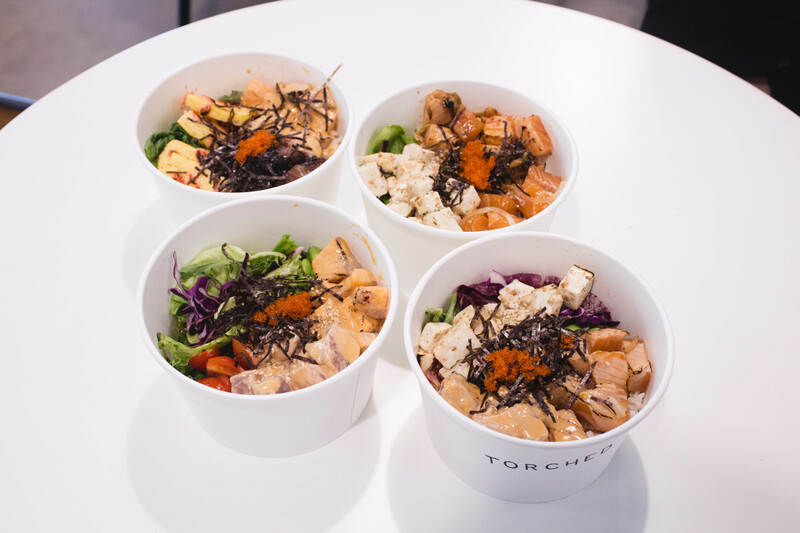 The next time you’re in the Bugis area and are craving a hearty bowl of poke, drop by Torched! Simple, delicious and oh-so-photogenic, these rice bowls are a straightforward choice for a lunch break or a quick friend-date with the girls.